Signs ups are closed - if your team still wishes to participate, please email team 4216 mentor Pam Trent @ ptrent@cox.net. The scrimmage is right around the corner! Please see the attached MAP for where we will be located - all teams should check in at our locations BEFORE entering. Tickets are provided free to all FIRST participants which we will distribute from our table. You will need to pay for parking ($14). IF you have already purchased a ticket for this event, please bring it with you and the region can receive credit for tickets already purchased. Teams should be prepared to haul their equipment in from the parking lot (bring a dolly, wagon or cart). Please be flexible during this event – we will have a lot of teams wanting to get practice and have practice rounds. How that works will largely be dependent on our self-organization during the event. Bring Safety Glasses!!! Tournament managing team mentors will be watching to make sure that rule is followed strictly while working on your robot AND while within 2 feet of the field perimeter. …and most importantly Gracious Professionalism – let’s see Students building their own robots and helping each other! Table displays are NOT required but if you bring one, it should be limited to a 6’ table area. 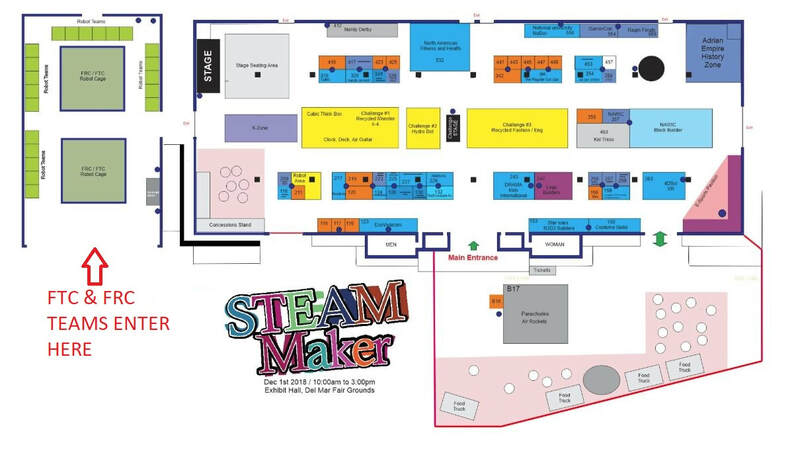 SDFTC partners with the STEAMMaker Festival to volunteer to help them set up chairs and tables in exchange for giving us a large venue to hold this scrimmage and show off First Tech Challenge robotics to a large number of kids who have never seen FIRST before. Come be part of the experience, practice on this year's field, network with local teams. This is a great opportunity for rookie teams to see a competition in action before your first official tournament. Teams will sign up for a morning slot, afternoon slot or both if they would like to be there the whole day! We hope to have 4-6 FRC teams there to help us too! Each team will have a 6’ table - please only bring your table display that would be appropriate for a League tournament or Regional tournament, but table displays are NOT REQUIRED! Power distribution might be an issue, so please bring an extension cord and terminal strip for your team. Tournament runs will be “dynamic.” It is nearly impossible to truly run this like a real tournament, but we will try to hold some tournament style runs. Team mentors may be asked to help set up actual field practice runs. Some referees, scorekeepers and tournament personnel will also be there to test out the new field scoring process, software, etc. How to enter (Tickets will be covered by the region again this year thanks to Qualcomm!) and parking details (paid parking is an unfortunate part of this venue) will be send via email to the signed up teams 1 weeks before the event. Sign up here: SDFTC Scrimmage at STEAMMaker Sign Ups!